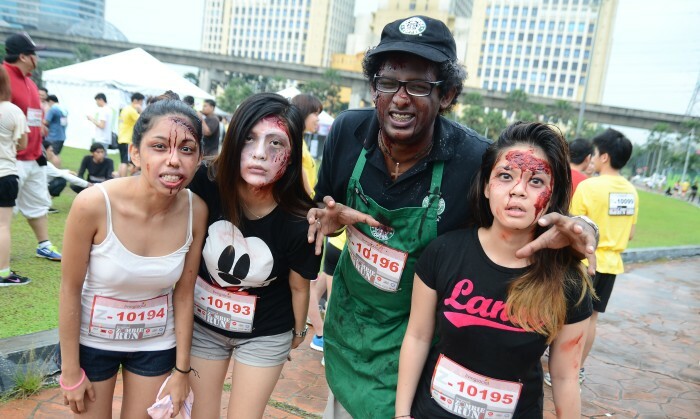 Zombies roamed the streets of Petaling Jaya over the weekend in a run organised by LivingSocial Malaysia. The 5km Zombie Run saw over 2000 participants engaged in a night run with zombies lurking around corners and among the crowd that was both exhilarating and exciting for Malaysians. The zombie atmosphere was created by LivingSocial’s official makeup artist Kai Image Academy with makeup sponsored by Mehron. The transformation of volunteered zombies started at 3pm and took an estimated of 5 hours to complete. A list of sponsors provided support for participating runners such as Tune Hotels with free lives, drinks by Revive, towels from Pakaian Hari Hari and limited edition of Everlast T-shirts. A flash dance surprise ending by iDance Studio to the famous Michael Jackson “Thriller” was seen after the race as well as performances provided through Wanted Symphony of local talents like DJ Sean D and KL Mobile DJ. Red.FM was the official radio sponsor along with food and beverages by popular outlets such as Café Kaseh, Station One, Crazy Potato, All Rice Food Truck, and more. MyTeksi was also the transportation partner who provided transit for orphanages attending the run and the public. Winners walked away with prizes worth up to RM 3,000, sponsored by LivingSocial Malaysia, TRON and Preventive Healthcare. Tune Hotels also gave out 15 free lives with a free 3D/2N stay at one of its hotels. Zombie -themed runs have been organised around the world since the hype of zombie apocalypse took the interest of youths. This is Malaysia’s first attempt in replicating the success of the theme and the first run organised by LivingSocial Malaysia. The budget airline market in Hong Kong is still a small part of the travel industry, but low cost carrier Hong Kong Express has bi.. Founder Malek Ali has described the recent sexual harassment allegations as "upsetting and distressing" for everyone at the radio ..
Pepsi urges consumers to help light up an entire community this holy month of Ramadan. ..